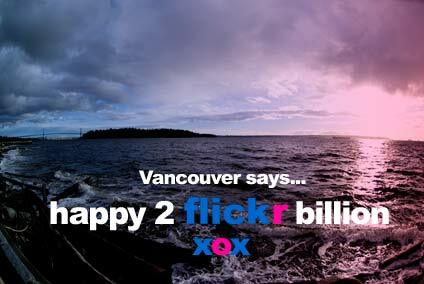 In the Flickr blog today they mention that they hit their 2-billionth upload. To get a sense of the sheer volume, just check the ‘explore’ function. If you select “most recent uploads” Flickr tells you how many photos were uploaded in the last minute. I’m usually seeing numbers between 2,500 – 3,500. That means that in one hour, at the low end, there are 150,000 uploads. Over a day, even at the low end, that’s 3,600,000 photos uploaded. At that rate, it would take over 555 days to hit 2-billion. Flickr’s been around longer than that of course, the URL was first registered 4 years ago this month. But obviously they had no-where near this kind of uptake in the early days, and these days, I’m sure they have days that go way over that low number I’m using. It’s staggering to think about this kind of volume. And Flickr is just one of many photo-upload sites. Add in the social networking sites that also allow photo uploads, and you really have to be impressed with sheer volume of images being uploaded, stored, tagged and displayed. We used to keep our photos in a shoe box in a closet somewhere – the more annoying members of my family held regular ‘slide nights’ when they’d show off their snaps from their latest trip to Minot. Essentially, our family photos quietly gathered dust somewhere. Now, they’re on display for the world to see, and in some cases downloaded, not only by friends of family, but by total strangers. Sure there are a lot of budding photographer types who use Flickr as a giant sounding board for their work, but mostly, it’s just regular photos taken by regular folks. Some of them even on a trip to Minot. Encourage that kind of behavious, and the next thing you know you’ve got 2-billion pictures on your hard drive.